This morning we woke up in lovely cabañas to the sound of birds and surf in Puerto Lopez. We enjoyed a breakfast of fresh fruit, eggs, bread, and coffee. At 8:30 we headed into town to board the boat for a whale watch and hike on Isla de la Plata (otherwise known as the poor man’s Galapagos). We met our guides, kicked off our sandals, and admired the Pacific on our 1½-hour ride to the island. The ocean water was so mesmerizing that it only seemed to take five minutes to arrive. Our approach to the island was a scene of crashing waves, swarming birds, and high cliffs. Our guide showed us the map of the hiking trails, explaining that some were closed for albatross nesting and off we went. We saw lizards, Algarrobo trees, and even rats. A fisherman had accidentally introduced rats to the island and they have become an invasive species. Therefore, although the island was very clean, several tubes containing rat poison were sporadically placed to the side of the paths. They are trying to control the rat population but aren’t concerned about this affecting the food chain because the rats don’t have predators on the island. We hiked up the steep terrain to enjoy the cool breeze and panoramic view. As we continued on we saw Blue-footed Boobies preparing for their mating season. Our guide explained how to differentiate between the male and the female boobies: the male is smaller, has dilated pupils, and makes a whistling sound while the female makes a honking sound. We heard this, and were able to witness the dance that the male uses to impress the female. Male Blue-footed Booby on the Isla de la Plata. 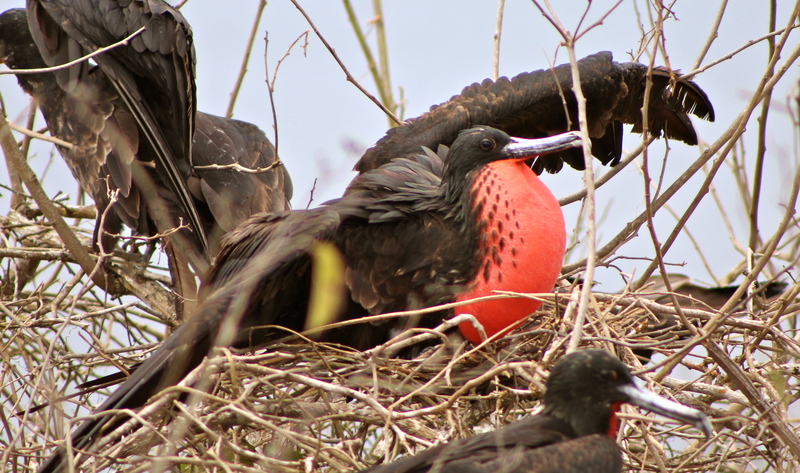 Next along our trail we stopped at the frigatebird colonies where the males were showing their engorged gular pouches in order to court the females. Once the pouches become engorged, they stay like this for a month, making it hard for them to eat or fly. 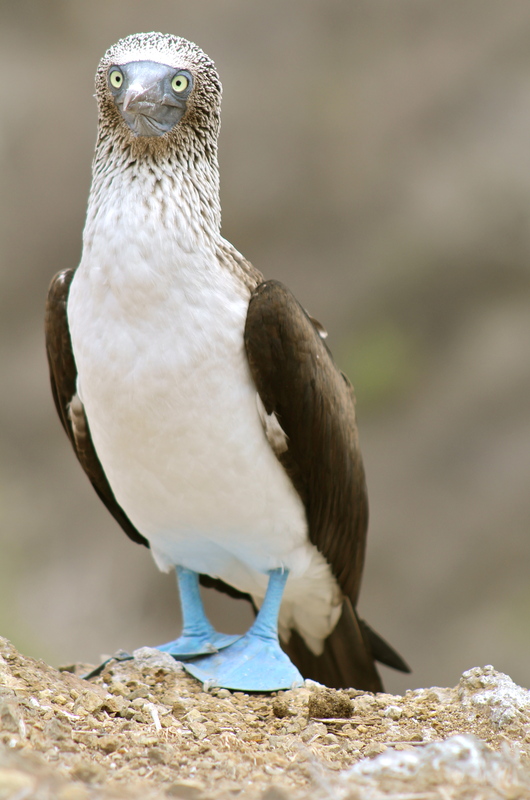 The nickname for the frigatebird is the pirate bird because they aggravate the Blue-footed Boobies to the point where they will throw up the fish in their stomach for the frigates to steal. Our trip here was a great display of survival of the fittest — and the prettiest. Male Magnificent Frigatebird with inflated gular pouch. With a new appreciation for this ecosystem, we hiked back down the mountain to board the boat for lunch where we were greeted by Green Sea Turtles. The guides were feeding them pineapple to keep them close to the boat, and although we loved having them at an arm’s length away, we would have preferred to see the turtles feed and swim naturally. We headed back out to sea in search of Humpback Whales, which migrate from the Antarctic, where they feed, to warmer waters off the Ecuadorian coast to breed and give birth to their calves. We feel lucky to have not only seen one whale, but also a social pod of six displaying very active behaviors. We were entranced by these huge mammals and took a lot of photos. 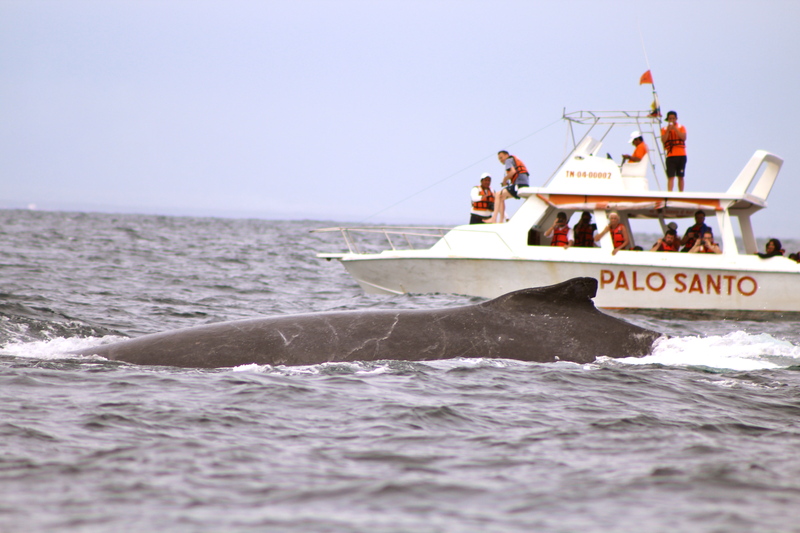 Humpback whale seen off Isla de la Plata. We zoomed back to the mainland in hopes of catching the last half of the World Cup game against France. Afterwards we had our nightly meeting where we reviewed our goals, reflected on our travels, and shared our appreciation for each other and the entire experience. Ecuador has treated us so well and there is no disputing that the land and the people will always have a special place in our hearts. Great way summary again! The whales would probably be my favorite part!